Sabrblade wrote: ...Erm, not really. For one, it's definitely a winged insect, whereas Tarantulas was a spider (eight-legged arachnid with no wings). And Tarantulas only ever have two arms in robot mode, as opposed to this four-armed bug bot. not to mention Tarantulas' visor, unlike this guy's pair of normal eyes. you very well know that if they were to make movie versions of BW chracters they wouldn't be exactly the same. four arms remind me of the spider legs on Turantulas's back. Besides, it's close to Turantulas than it is waspy! Spiders are arachnids, not insects. Spiders have eight legs, and just a head & abdomen. Insects have six legs and a head, an abdomen, and a thorax in between. Insecticon has all these elements. He is not a spider. 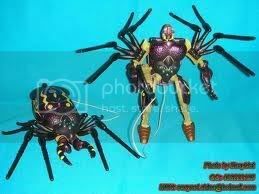 Sabrblade wrote: Or, if they wanted to keep the bug motif, they could use 2010 Scout class Insection for a movie Waspinator. Nah. I like Proto Starscream better. This may be a shocker, but I don't care if they keep the insect motif. Afterall, there is a character named "Bumblebee" and his alt mode has nothing to do with the animal namesake. If anything, it would just be Movie Protoform Waspinator. Yuuuup. I retract what I previous said about using Cybertron Scrapmetal for a DoFP Tarantulas. I was under the false assumption that Scrapmetal was a Deluxe. Turns out he a Scout Class figure. Let's go with Cybertron Unicron on that one. Sabrblade wrote: I retract what I previous said about using Cybertron Scrapmetal for a DoFP Tarantulas. I was under the false assumption that Scrapmetal was a Deluxe. Turns out he a Scout Class figure. Let's go with Cybertron Unicron on that one. a) You didn't know that? For B, yeah, but when you consider Blackarachnia, it'd seem kinda weird seeing the guy that she's supposed to be a redeco of being shorter than her, toy-wise. And, like we said before, the Unicron toy does bear a little better resemblance to Tarantulas' over body shape than the Scrapmetal toy does. He could still get a new head, though. Last night, I went to my local Toys 'R' Us (and also realized that there was a TJ Maxx next door to it). It was late, nearly closing time for both stores, but cursed curiosity compelled me to stay. By sheer good fortune, TRU had one single Voyager Sea Spray remaining on their shelf, and TJ Maxx also happened to have a couple of Scout class Breachers. At the last minute, I was able to pick them both up just before each store closed. Having now personally handling Sea Spray and after some fiddling with it, I'd say that that figure really is our best bet (for now) with a Protoform X figure. He can be positioned into nearly the same poses a X was seen here, but, like I said before, there would some artistic liberties taken with such an interpretation of X with this mold, since it isn't an exact match and the differences between each are pretty visibly clear.